Helicobacter pylori is a bacteria that infects the stomach and small intestine of dogs, cats and people. Several species of Helicobacter have been isolated from dogs and cats but, according to The MERCK Veterinary Manual, “their significance is unknown.” In other words, it’s not always clear how the bacterium affects animals. As a result, veterinarians look closely at what it does to humans. In humans, inflamation associated with persistent bacteria is associated with gastro duodenal ulcers and even cancers. Up to 50% of people are persistently infected even if they have no clinical signs, says Retro Neiger and Kenneth Simpson at epi4dogs.com. As in human medicine, the mode of transmission is unclear. It is very possibly spread by oral ingestion of contaminated food and water, but oral transmission by ingestion of vomitus is more likely, especially in puppies. Most infections are acquired during childhood and a person can then carry the infection for life and never develop symptoms. Like humans, infection in dogs primarily occurs when they’re young, specifically during puppyhood. What are the symptoms of Helicobacter? The prevalence of gastric Helicobacter spp. in dogs and cats is high but, unlike in people, there has been no strong association with gastric ulcers. Studies of the pathology and clinical signs associated with infections in dogs have not been extensive so we really don’t know how damaging the organism is to them. However, studies have shown that untreated infections can result in significant inflammation. As a result, there is debate around whether organisms should be treated or not. Diagnostic tests consist of invasive tests (rapid urease test, histopathology, touch cytology, culture, PCR, electron microscopy), which all require a biopsy sample from the stomach lining. 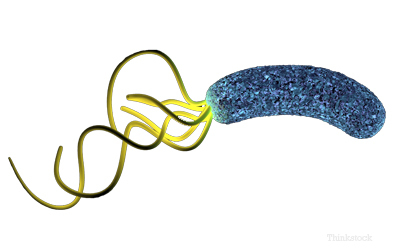 Can you catch Helicobacter from animals? In recent years endoscopic examinations and gastric biopsies have become more widely available to veterinarians. As a result, the organism is being seen more commonly in dogs. Although dogs and cats may be carriers of Helicobacter, these organisms are specific to dogs and cats. There is no indication that dogs or cats can infect humans.